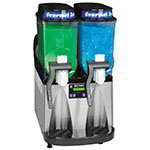 Our restraurant quality frozen beverage machine will help make your party extra special. Order one of our high quality frozen beverage mixes below or you could also make fun frozen fruit, soda, or cream based frozen drinks for the whole family. Of course this machine also makes amazing margaritas or daiquiris! Parents should have some fun too! Our professional frozen granita machine allows you to make restaurant quality frozen beverages at home. Each side can hold up to 3 gallons. If you don't need both sides, you can just run one side. It typically takes 1-2hrs to freeze the mix after machine is turned on. We deliver our machine to your home on a cart so no need to worry about counter space. No need to worry about cleaning the machine because we take care of that too. Enough mix to make 3 gallons of margaritas. This will fill one side of our margarita machine(about 30 servings). Our strawberry margarita mix is great with or without alcohol. Mix is enough to make 3 gallons. Will fill one side of our margarita machine(enough for about 30 servings). Our restaurant quality mango margarita mix is sure to liven up your party. This mix is tasty with or without alcohol added. Mix is enough to make 3 gallons and will fill one side of our margarita machine(about 30 servings).